There will be a groundbreaking ceremony for the reconstruction of the BOCES barn at one of Orange County, New York’s most distinctive landmarks, Goshen Historic Track, which opened in 1838. 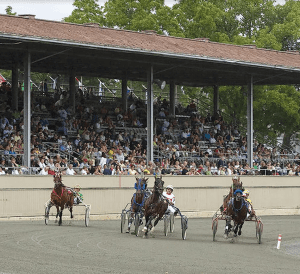 Partially destroyed by a fire in 2017, the world’s oldest operating harness racing track is rebuilding to preserve a uniquely American tradition and continue serving as a community greenspace. The BOCES barn, so named because it was an extension of the Board of Cooperative Educational Services, functioned as a training center focusing on equestrian care and farm management. The Track’s historic blacksmith and farrier shop was also lost in the fire. Working with preservation architects at LAN Associates, the Historic Track and the Harness Racing Museum & Hall of Fame plan to replace the lost structures, preserving much of their original character, while providing the museum with safe housing for its artifacts. The Board of Directors of Goshen Historic Track and Trustees of The Harness Racing Museum and Hall of Fame will be on hand at the groundbreaking, which will take place on Tuesday, April 2, 2019 at 11 am. The Goshen Historic Track is located at 44 Park Place, Goshen. Light refreshments will be served. For more information, visit the Track’s website. To donate to help the Track meet a matching fund, you can do so by credit card via PayPal or by calling (845) 294-5333 during weekdays. Checks made out to Goshen Historic Track can also be mailed to Goshen Historic Track, 44 Park Place, Goshen, NY 10924. Photo of Grand Circuit racing at Goshen Historic Track by Geri Schwarz.